The Cold War has officially jumped the shark. Yesterday, President Obama signed a strategic arms reduction treaty (the "New START") with the president of Russia. This is the first nuclear warhead treaty with Russia in 20 years. It will reduce both countries' stockpiles of nuclear warheads by one-third. And, as far as the network news in America was concerned, it was a very ho-hum story. To me, this marks a low point in television "journalism" -- and, these days, that's hard to do, since they're all in a rush to bottom-feeding anyway. Last night, the lead story on every network should have been the treaty signing. It wasn't. Leading the news was the story of a monumentally stupid diplomat sneaking a smoke in an airplane bathroom, which was played for all the terrorism fear the networks could manage. Following this was the continuing story of the mine disaster in West Virginia, where nothing much happened (which didn't stop the networks from in-depth reporting on the nothing which had happened). Following this -- you simply cannot make this stuff up -- was Tiger Woods' return to professional golf. As an afterthought, the two nations with over 90 percent of the nuclear weapons on the planet agreed to get rid of a substantial number of them, which would bring the nuclear arms race back to levels the world has not seen since the 1960s. Obviously, for news program directors, not that big a deal (I do have to give credit to PBS' News Hour for not only running it as the lead story, but for taking 20 minutes out of the hour to discuss it -- but then PBS is always better at this sort of thing). Which is why I say that the Cold War has now officially jumped the shark. Now, this term itself is becoming a relic of the Cold War, so (for my younger readers), allow me to explain (wait a minute... I think I may just have declared that "jumped the shark" has itself jumped the shark, which truly causes the mind to boggle... but I digress). There was a television show in the 1970s which was comprised of soft-focus nostalgia for the decade when the Cold War truly got going: the 1950s (and which itself was a blatant ripoff of the excellent movie American Graffiti, but that's beside the point, and yet another annoying digression). The show was funny and popular when it first came on the airwaves. 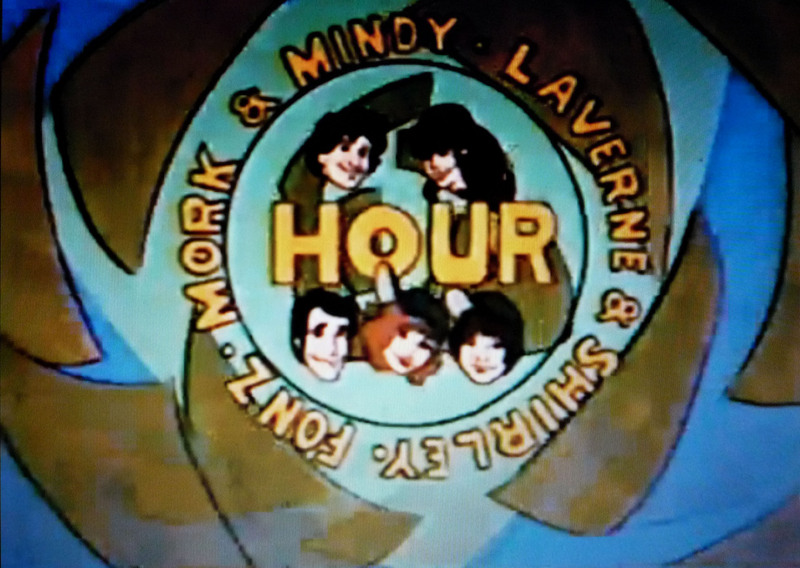 Then, after a few seasons, and a few notable spinoffs (Laverne and Shirley, and -- believe it or not -- Mork and Mindy), the show began to flounder a bit and become so formulaic that its ratings slid (and its spinoffs got worse and less popular as well, if anyone remembers Joanie Loves Chachi or Blansky's Beauties). To combat this, they had a two part cliff-hanger episode -- which was meant to cash in on another popular movie (Jaws) -- where a main character waterski-jumped over a penned-up shark. While wearing a leather jacket, by the way. Again, you simply cannot make this stuff up. Much later, after the show went off the air, the phrase "jumping the shark" entered the lexicon to signify the exact moment when something no longer was popular, or even relevant to most folks. Which is where we are today. Previous arms-control treaties were big news. Not big news, even, but enormous news. Take all the coverage we just had over the health reform debate, and multiply that by about 10, and that's something like how big the news of this sort of thing used to be. The future of the planet hung in the balance, and the story was treated appropriately. Now, not so much. Since the demise of the Soviet Union, nuclear weapons have faded in importance for the public. This, it should be pointed out, was not always the case. In the 1980s, "No Nukes!" rallies were the biggest political take-to-the-streets events in Washington. Other than perhaps apartheid, it was the biggest "cause" of the day. Now, again, not so much. I guess it's a positive thing, in a way, that we can afford to pay so little attention, as a country, to these things any more. The fear of World War III is, indeed, is now thought of as quaint and a bit nostalgic, when thought of at all. But still, the fact that a professional golfer's marital problems rate higher among network news directors than reducing world nuclear stockpiles by a whopping one-third signifies this shift more than anything else I've ever seen. Which is why I say, once again, that the Cold War has indeed jumped the shark. While President Obama certainly signed an impressive treaty this week, we feel we have to give credit where credit is due, instead. Which is why, this week, we are awarding the Most Impressive Democrat Of The Week award to none other than Secretary of State Hillary Clinton. Because this treaty is not only a stunning achievement for the president, it is also an enormous accomplishment for Clinton, who now joins the ranks of our most effective Secretaries of State in modern times. Hillary Clinton's job description is to do this sort of thing, remember. And she produced a treaty for her boss to sign, showing she was indeed the right person chosen for this job. Clinton (and the State Department as a whole) produced an impressive accomplishment that her husband never even managed, when he was president. Clinton's role in the process was largely in the background. This is another reason why she wins the MIDOTW award -- because, ever since she started her job, she has never made herself "the story" in any international issue. And, it must be acknowledged, she has kept her husband on a very tight leash (when it comes to the media) as well -- something which was seen as a worrisome issue when her nomination was announced. Some Secretaries of State tend to hog the limelight, and (by doing so) upstage their bosses. Hillary Clinton has not taken this route. Instead, she has worked at her job much like she worked at her first Senate term -- grinding out impressive work, while keeping her head down in the media spotlight. For all of this, and for producing the treaty the president just signed (which is a welcome step back from the insanity of the Cold War arms race), Hillary Clinton was indeed the Most Impressive Democrat Of The Week. Well done, Secretary Clinton! While President Obama has recently made some disturbing moves on the national security front, he misses out this week on the Most Disappointing Democrat Of The Week as well. Because, in keeping with our "nuclear" theme this week, we have to hand out the MDDOTW for an incident which actually happened last week (but then, we skipped writing this column last week, so he's still fair game in our book). Anime is a prime example of why two nukes just wasn't enough. Got that? We should have turned Japan into a nuclear wasteland at the end of World War II, just so that they couldn't come back decades later and corrupt America with their animated cartoons. He later apologized, saying he thought it would be a private joke among his friends. Sometimes, politicians say things which are so monumentally stupid that they leave even us utterly speechless and at a loss for words. This, sadly, is one of those times. Nick Levasseur wins not only this week's Most Disappointing Democrat Of The Week, he also wins a special Stupidest Comment We've Heard In A Long, Long Time raspberry as well. Because, when words fail, sometimes a Bronx cheer is the only intelligent response. It's been rather a strange week for us here. Last week, we pre-empted this column so we could instead present you with an old episode of Happy Days. No wait, that can't be right.... Ahem. But because we (speaking of comic books) attempted a "crossover" to shamelessly plug our monthly Obama poll column, we subsequently went through a sort of "spin withdrawal" all weekend long, and (as a result) devoted all of Monday's column to one particular talking point (which I'm going to repeat below, never fear). The weirdest part of the week, though, was yesterday, when I felt compelled (for some strange reason) to post a column entitled "In (Partial) Defense Of Michele Bachmann," which is not the usual thing, shall we say, in this column space. But enough of all this shameless plugapalooza-ing. Let's get to this week's talking points instead! "You know there's an old saying that 'politics stops at the water's edge,' which was coined for exactly this situation. There are some things that are simply more important than whether you're a Democrat or Republican. Foreign policy should be debated on the merits of this treaty, and not become some sort of political tug-of-war between Democrats and Republicans. I feel confident that the Republicans will join President Obama, and ratify this significant nuclear arms reduction treaty, because it is the right thing to do. Any Republican who tries to somehow make some sort of political hay out of the issue is going to show the world that playing politics is somehow more important to them. But I truly believe that this won't happen, because I believe Republicans agree that politics should stop at the water's edge." This news just broke today, to the ecstatic joy of political reporters everywhere, who are gleefully inking in the confirmation hearings for Obama's second Supreme Court pick on their calendars, for sometime this summer. After all, it will be a field day for punditizing, as it always is. But Democrats need to tamp down this irrational exuberance from the media, and remind everyone of the particulars of the situation -- that nothing much is going to change. This is not to lower expectations for the nominee, when he or she is named by the president, but rather to lower expectations that this is going to significantly change the court's makeup in any way whatsoever. Obama will get a chance to put his stamp on the high court when -- and not until -- a conservative justice steps down. If this happens before Obama leaves office, then we will have a ideological nominee battle which could significantly change the country's future. But this nominee will not be that battle -- which bears pointing out. "The news of John Paul Stevens' retirement from the Supreme Court is going to be a boom season for political chat shows and the like, I realize, but whomever the nominee turns out to be, the fact remains that the court's makeup isn't going to significantly change as a result of Stevens stepping down. Obama may nominate someone slightly more conservative or liberal, but on the real scale of these things, the court's makeup is going to stay pretty close to where it is. Obama now has his second chance to shape the court, but in both instances the justices he is replacing were already from the liberal side of the court. Obama won't get a real chance to change the court in any significant way until a conservative justice steps down. Which I think we should all keep in mind throughout the upcoming debate." As I mentioned, I wrote a whole article on this one, on Monday. The White House has come up with a decent job of framing the upcoming debate on financial reform -- call it "Wall Street reform." As I went into this in detail earlier, I'll just suggest you read the article if interested, and move quickly on to the talking point itself. Except to briefly mention that the Unions are organizing a march on Wall Street soon, so if you're in New York on April 29, join in the fun! "You mean 'Wall Street reform,' of course." SpongeBob SquarePants, as everybody knows, makes his home in Bikini Bottom. But this saccharine joke of a name is taking on a new meaning. And it's an important one for Democrats this fall, because it should be the center of the Democrats' midterm election strategy -- "The economy's getting better because of Democrats." Now, there are two ways this could play out. Either the economy noticeably improves by November, or it doesn't. In the latter case, Democrats are going to be slaughtered at the polls anyway, so it doesn't much matter what they attempt to run on. But if the former happens -- if things are looking up economically in November -- then Democrats have got to drive the point home: "we turned things around." The reason Democrats are so shy of doing so is likely due to what happens when politicians over-promise what they don't end up delivering (see: Obama's prediction unemployment would stay below eight percent if the stimulus package passed). But, at this point, Democrats really have nothing to lose by this strategy, because as I mentioned, they're going to get routed out if the economy looks bad in November. But, to do this, Democrats have to do something they're not very good at, which is claiming credit for their own accomplishments. Maybe they need a self-esteem class or something. Ahem. But, luckily for them, there are some graphics which will help them out with the overriding theme: "Democrats are turning things around for America -- why would we ever want to go back?" "What you see behind me is a chart of America's monthly job loss figures. The part on the left in red is what happened under President Bush. The blue parts are what has happened since President Obama took office. This is what putting Democrats in charge has done -- turned this around so dramatically that we're now adding more than 100,000 jobs per month, instead of losing 750,000 jobs per month, as we were when Bush left office. Democrats are turning things around, after a Republican economic disaster. Which is why you should vote for a Democrat this November if you want to see it continue." The second graph which Democrats should be bragging about is the one which shows the Dow Jones Industrial Average since President Obama took office. Today, the Dow briefly broke through the 11,000 mark, which hasn't happened since the slide began under Bush. Democrats need to point this out, whenever possible. As well as other helpful economic charts (here's a few from Ezra Klein over at the Washington Post) which show similar rising economic indicators. "Just this week, the Dow Jones topped 11,000 for the first time in over a year. Now, this may not sound like a big deal to folks who are still looking for work, but the Dow is what's called a 'leading indicator' which, when it rises, usually signifies the people who know are betting that the economy is going to get better soon. Jobs are what's known as a 'lagging indicator,' which recovers at a slower rate than the Dow. But I am optimistic, seeing the Dow regain the ground it lost, because it means that things are going to continue to improve under the Democrats' stewardship of the economy. The jobs numbers are improving as well, and we've got some work to do to see that these gains continue, but I remain positive about future job growth, personally." Virginia, after having a Democratic governor for a while, is now back in Republican hands. Meaning that it's time to revel (if not Rebel) in glorifying the Confederacy once again. You just can't make this stuff up, folks. "I see that Virginia's governor had to recently apologize for his proclamation of April as Confederate History Month within the Commonwealth, since he somehow forgot to mention slavery. The governor later exacerbated this slap in the face to African-Americans by suggesting that he was only interested in 'significant' bits of Civil War history. You know, what astonishes me about this whole sordid affair is that Republicans, every time they do something like this, don't connect it to the fact that their party is seen as so hostile to minorities. If you're looking for the reason why African-Americans vote so reliably for Democrats, you needn't look further than incidents like this one. It's sad, really, what the Party of Lincoln has come to these days." Replying to the Census means you love Obama -- spread the word! "You know what I heard? I heard that there are special inks on the Census form which can tell from your sweat how you voted in the last election. And that when you return your form, if you didn't vote for Obama your name will be put on The List. I certainly wouldn't want you or your family on The List, so I just wanted to warn you before you sent your form in. Because you really, really don't want to be on The List... do you?" #3 - it's nice that unions are marching on wall street, but i wish they would also march on Tallahassee, because the future of my livelihood may hang in the balance. unless charlie crist produces a miracle veto, a bill will soon become law that makes all teacher pay based on their students' standardized test scores. it forbids school districts from paying teachers based on years of service or advanced degrees, and allows districts to relocate teachers arbitrarily to any class in any school they want. it's ostensibly supposed to motivate better teaching, but attrition is a much more likely result. i've read the whole bill, and it's flat scary. any teacher who has an advanced education and/or career options will be hard-pressed not to leave either the profession or the state. o combat this, they had a two part cliff-hanger episode -- which was meant to cash in on another popular movie (Jaws) -- where a main character waterski-jumped over a penned-up shark. While wearing a leather jacket, by the way. 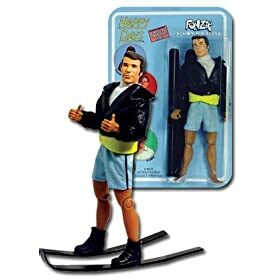 Someone please correct me if I am wrong, but I am fairly certain that Fonzie jumped over the penned up shark on his motorcycle, not skis.. I mean, honestly.. Before "NEW" START, the US and Russia had enough nukes to destroy the planet 20 times over. After "NEW" START, the US & Russia have enough nukes to "destroy" the planet only 15 times over. That was a monumentally boneheaded statement..
She left a $23 p/h job to come to Florida in 1997. The best she could find in the county school district was a teacher's assistant position in a classroom of 33 kids for $7.50 p/h. She left the schools in 2000 to work for a family as a nanny and a home schooler. 3 kids @ $14 p/h. I beg to differ. 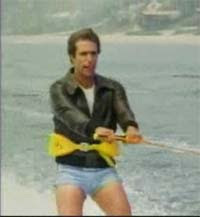 Fonzie was in swim trunks, and his signature leather jacket, when he "jumped the shark." He jumped something else with his motorcycle (a school bus?) in a different episode, I believe in response to whatever Evel Knievel was doing at the time. And if that isn't enough, here's the action figure. [Full-on Bronx cheer mode]: THBBBPPPBBBTTT!!!! We hereby introduce our new "LizM" link -- suggested by none other than commneter Elizabeth Miller here -- we have worked diligently all week, and are now ready to unveil our new "Commenting Tips" page to all and sundry. The link in question should now appear over everyone's comment entry box, in the introductory comments. We've put together all our advice on commenting into one page, and encourage everyone to take a look, and try some new tricks in your comment text. Let me know if you have any problems with the advice on this page, and again, we'd like to honor LizM for making the suggestion in the first place. This also has led us to a general notion of upgrading and modernizing all the static page links on this site, which will happen in the next few weeks. Anyway, let us know if any of the "Commenting Tips" advice works, doesn't work, or is downright confusing, because we're itching to hear some feedback on it. Since we're all on the subject, I have to point out that the funniest line ever uttered on "Happy Days" was by Robin Williams (then an unknown comic, cast as the alien "Mork" which would later lead him to fame and forture in his own hit sitcom). Mork was sitting in the living room set of the Cunninghams on "Happy Days" and watching a 1950s television -- which happened to be playing an episode of the "Andy Griffith Show." Which, as you'll all recall, was the acting start for Ron Howard (when he was about six or seven years old), who later became (of course) "Richie Cunningham" in "Happy Days." Williams' priceless line, after befriending "Richie Cunningham" in the HD episode, of course, after watching Ron Howard on the TV screen in "the 1950s" was: "I like that boy Opie!" There were plenty of funny lines on "Happy Days," but none (in my humble opinion) funnier than that one. Which, as it turned out, gave the world the comic genius of Robin Williams. "I was wr..... I was waaa....."
Yea, I remember now.. The Shark Jump episode was when everyone went out to California..
By the by, that's another indication that a hit show is on the down turn. When they move the entire cast to an "exotic" new location. The Brady Bunch in Hawaii is another example. Did you know that Happy Days itself was actually a spinoff of LOVE, AMERICAN STYLE and NOT American Graffiti?? And, despite the disaster that was the JOANIE LOVES CHACHI spin-off (1982-1983), there was another grotesque spin-off. Speaking of spin-offs, do you know the show that had the most spin-offs, 17?? CW: I like the tips page, simple and elegant. It reminded me about stuff i knew at some point but hadn't thought about in ages. michale: there does exist a way to change things here in florida. have you heard about this november's anti-gerrymandering initiatives? I've never seen the LAS sketch that spun off HD, but I was vaguely aware of it. You'll notice I said "ripoff" not "spinoff" re: AG, which HD definitely was. Um, at a guess, I'd say "All In The Family" was king of the spinoffs? Probably wrong, but I bet it's at least in the top 10. Did you know that (like "The Office") AITF was an Americanized version of a British series? Didn't learn that until a few years ago, myself. Everyone have fun with the Commenting Tips page! As for the more serious Florida issue, is this the bill that -- if Crist vetoes it -- will cause him to lose all the remaining GOP support he's got left (like Jeb) or is this a different bill? OK, back to TV trivia. When I wrote the Happy Days stuff in this article, I did so from memory (I had plenty of other facts to check, so didn't bother). What I couldn't remember (so I just left it out) was whether the shark 2-part episode (which was a cliff-hanger, part 1 ended with Fonzie literally in midair, as I recall...) was split between two seasons (as Dallas later did with "Who Shot JR?") so we had to wait all summer to find out whether Fonzie got chomped or not, or whether it just aired sequentially. Anyone? yup, that's the bill. the leader of the florida republican party is the bill's sponsor, and the millions of extra dollars it puts into standardized testing has jeb bush's fingerprints all over it. crist is already going to lose the nomination, and signing this will probably not win it for him, so there's still a glimmer of hope (albeit not much of one). Chris: I'm afraid I did a double-take when I saw "I've never seen the LAS sketch that spun off HD, but I was vaguely aware of it. ", since I knew, and you even wrote, that "Laverne and Shirley" was a spin-off of "Happy Days", not the other way around. Then I looked again. "Love American Style". Oh. Um, at a guess, I'd say "All In The Family" was king of the spinoffs? 17 Spinoffs from ARCHIE, which is a "spinoff" itself from the Archie Comics..
Michale: It's true what you say about a series trying extreme things to resuscitate itself, but the Hollywood thing happened less than half-way through the series 11-season run, at the start of season 5. I cheated and went to the IMDB. There was a three-part "Hollywood" episode from Sept. 1977 which includes the shark-jumping incident, or perhaps to be more accurate, or at least cautions, it includes a shark jumping incident. Peter:"If I was any closer behind you, I would be in front of you!" Seriously, it's nice to know that being the most computer-illiterate commenter here is good for something. But, that dubious distinction won't last for long as I intend to make very good use of the Commenting Tips. As you can see, with any semblance of luck on my part, the advice that you have presented here to improve the aesthetic component of our ... okay, of my comments is so clear and concise that even I can follow it. P.S. The comment numbers look pretty good, too! Well, 'my' didn't get underlined ... but, 3 out of ain't bad ... I suppose. I'm calling it a day. All I remember was it was a cheap way to try to get the "surfer craze" into the storyline. I actually thought the series "jumped the shark" when Richie went off to college (which is why American Graffiti ended with that, a wise move). but I guess it should have been "L,AS" rather than "LAS" so I guess I'm OK. I never in a million years would have guessed Archie. Not TV, but an asterisk on that list should be the group "The Archies" who sang "Sugar, Sugar" which beat the Beatles out for #1 the year it came out, if memory serves. I just got here yesterday, thanks to comment response on HuffPost by CW, but I checked out the commenting tips and found it concise, accurate and clear enough for anyone to use. So I have a question, which I don't propose to answer by experimenting here: are the HTML tags mentioned the only ones recognized within comments, or are all tags that might be relevant in the comment context valid, or something in-between? Williams may have had a good line on Happy Days, but he jumped the shark himself a long time ago. I'm guessing around the time of Hook or perhaps when he went off the cocaine. He still has moments. But is it just me or is it getting more and more painful watching him try to his same routine? Williams was great in HOOK. Loved it..
And he was simply outstanding in LIVE AT THE MET. His most recent stand-up WEAPONS OF SELF DESTRUCTION was not so funny. He seemed to use profanity, just for the sake of profanity. His whole routine seemed forced and he wasn't really into it. Heheh. Yeah, maybe it's the forced part of his act these days. A more recent "Happy Days" moment I thought was truly hysterical was when Henry Winkler's character on "Arrested Development" was replaced by Bob Loblaw (say this fast for greatest effect) who was played by Scott Baio. Baio's character, Chachi, originally was brought onto Happy Days to appeal to younger audiences. They play this up in AD with Baio saying things like he skews better with younger juries. It's still hard to believe the network canceled such a great show. "Baseball players go in front of a grand jury and say yeah, i did cocaine, but can you blame me, it's a slow g'ddamn game! i'm standing out there in left field and there's a long white line going all the way down to home plate!" Does anyone else find "bikini bottom" the strangest framing ever to come out of Washington? Personally, I think it's hilarious. Some other tags work, some don't. But more advanced tags are more open to hacking, so I don't like to advertise exactly which ones work and which don't. Try one out, if you like, and see what it looks like. I've been investigating adding a "preview" feature to the comments, so you can see your comments before they post, but haven't gotten very far with it yet, sorry. You're right about Williams, he has seemed to lose his edge a bit recently. But, as you said, he still does have his moments. Didn't see Baio replacing Winkler on AD, but you're right that's a situation ripe for "inside jokes." I did like the ensemble case (with Winkler, I believe, although I could be wrong) for the short-lived cartoon "Sit Down, Shut Up." Which, I have to admit, I watch because I think Kirsten Chenowith is cute as a button, even when you can't actually see her. Heh. The funniest bit I remember from Robin Williams was off his first comedy album (forget what it is called), his imitation of a "New York City echo"
[said as a tourist would say it at an echo point]: "Helloo-oo-oo-oo..."
Heh. That one still gets me.